Do You Know The Maker ? 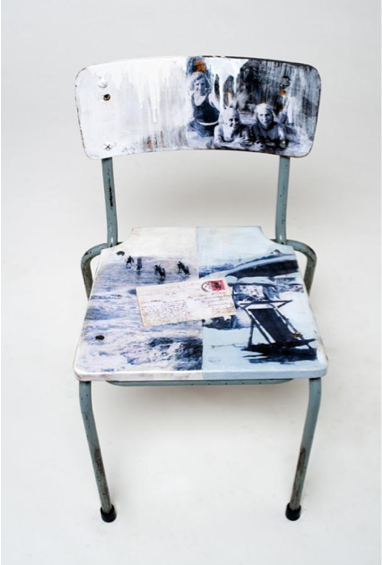 A few weeks back I grabbed this beautiful decoupaged chair image (and what I thought was it's link) and for some reason the two lost each other. Does anyone know the maker? I know it's a collective out of South Africa (I believe I found it via a South African magazine - but my search has come up empty handed). I'd love to hear from you if you know (they make some beautiful pieces). In the meantime - this image actually inspired me to look into decoupage myself - it's been years since I've done anything like it and have totally forgotten how. I did a post on it (a how-to link, along with inspiration) over at Babble today. Click here if you're interested. Update: (Thanks to reader Mariana - we now know. It's Amanda du Plessis and Elizabeth Pulles of Evolution). Thanks Mariana! sorry I don't ...but that is wonderful..! Yikes all those wonderful little school house chairs are going to be getting very hip makeovers...and I know Kevi @ Twig @ the Scout Market has this very chair to sell this weekend....! Thanks so much for highlighting the sale over here...great big shout out! Rachel & Lily are amazing & it is a privilege to be in their Markets!! Sorry don't know the maker either, but I would love to own it! Maybe you could make some yourself. Searched over 2.1572 billion images. and if these links don't work, contact me on my blog and I'll email you ;o) hope this helps...even if SHE'S not the artist behind this chair, her work is inspiring. Saw another similar chair in new edition of Ideas magazine (www.ideasmag.co.za) ...Evolution Chairs, sold at Poetry shops. Might be the same as mentioned above?